The First ATO Campaign Study! But if the whimper can be debated, the final "bang" is certain... Wintergewitter. Operation "Winter Storm" began as the final relief effort of surrounded Stalingrad, with a scratch Panzer Korps made up of units from all over the theater (and the strongest, 6th Panzer Division, coming back from refit in France!). Supported by already shaken Rumanian units, the force had 110 kilometers, two rivers, and two Soviet armies to cross, compounded by unusually mild early winter conditions, with as much rain as snow. (That would change after the battle.) They made it over halfway to Stalingrad, with the attack called off when 6th Panzer had to be used to support an Italian collapse which threatened losses even more catastrophic than Stalingrad. The game features different combat styles for mech/foot units, the importance of support, air and artillery operations, an attrition-based loss system and fog of war, with significant "initiative" benefits that urge both players to keep on attacking (or else...). 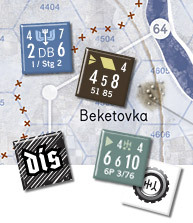 Players will use 560 two sided counters, representing units from regiments to companies and kampfgruppen. Students of the campaign will enjoy a highly detailed OB, drawn from both German and Soviet sources, and appreciate the realistic allowance of the very limited support of Operation Thunderclap from within the 6th Army pocket. Four scenarios are included, from a free-wheeling introductory ("We Are Coming") to the near despair of "Hoth's Last Gasp." A full campaign scenario allows players to fight through the entire 11 days that doomed the Third Reich, while a highly valid "what if" scenario allows the use of units which were assigned to the campaign but did not arrive in time, or units which were present and could have (should have?) been used. 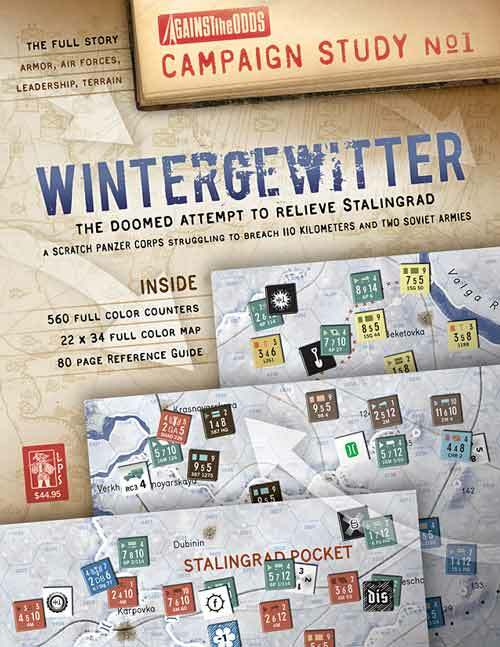 If you think you've seen it all with "panzers in the snow," check out the design innovations and "bang" you'll get from Wintergewitter... and ATO's first ever "Campaign Study," with both the complete game and a separate 56 page booklet with every article focused on the history behind the game. With over 50,000 words of text, adorned with situation maps, tables and Order of Battle diagrams by top writers and designers on Eastern Front warfare. The main historical narrative is by designer Mark Stille on the attempted counterstroke and its aftermath. Special articles by Prados, Tschanz, Heinsman, Mulholland, Webster, Grenier, and Nunez highlight armor, artillery, air forces, navies, disease, attrition, infantry weapons, politics, and propaganda to give you the inside scoop on the gears that turned the wheels of history during that fateful December of 1942. Weather, Luck, and What ifs are also included in this detailed look at one of the most desperate struggles of the 20th century, Operation Winter Storm. Better than a history book, you can read the articles and watch the action unfold before you on the game map. This boxed game is not a part of your subscription and must be ordered separately. But current ATO subscribers qualify for substantial savings. We've combined good game design with specialized research to give you fresh insights into campaigns you thought you already knew... starting with the big bang of Stalingrad. Not a subscriber yet? Sign up at the same time you order Wintergewitter below and take the subscriber's discounted price! Click here to view the contents spread below (in PDF format) for this Campaign Study from Against the Odds Magazine! Download a sample article and some bonus rules (in PDF format) for Wintergewitter. Download the rules (in PDF format) for Wintergewitter. Download the corrected and updated Turn Record Chart (in PDF format) for Wintergewitter. All of the above require Adobe Acrobat Reader version 5 or later. Free download here.